Some U.S. cities are known for expensive housing: In San Francisco, the median rent is $4,500. In New York, it's $2,875. That's compared to the national median of $1,637. And while rents in other cities haven't quite reached those levels, they are certainly increasing. That's according to financial website SmartAsset, which used data from the U.S. Census Bureau to identify where prices are trending upward. "To rank the places with the largest rent increases," the study says, "we looked at 50 U.S. cities," and compared their 2014 rent as a percent of household income to their 2017 rent under the same parameters. "To create the final rankings, we subtracted the 2017 rent as a percent of household income from the 2014 rent as a percent of household income." 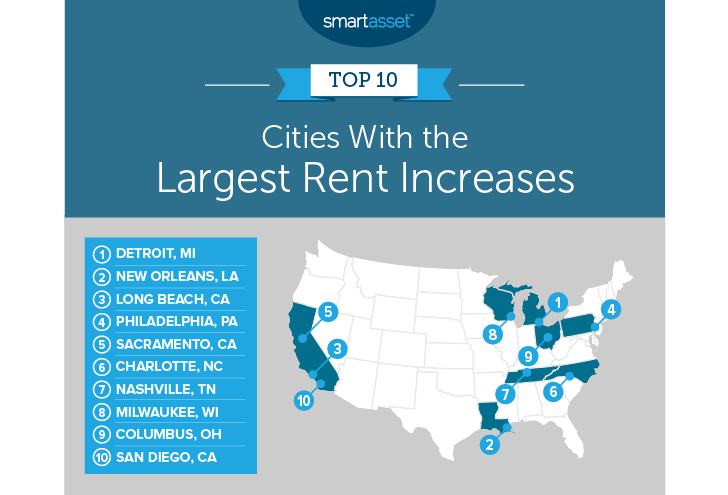 The cities where the relative cost of rent went up the most ranked first. The cities on the other end of the spectrum ranked last. "The cause of the rent increase was split between two problems: large rent increases outpacing substantial gains in income, or stagnant income growth amplifying the impact of small rent increases," according to the study. "New Orleans is an example of the latter. Incomes here only grew by $1,500 per year while monthly rent increased by $530 over the timeline we analyzed." While housing remainsexpensive in traditionally high-priced cities like New York, San Francisco and Los Angeles, relative rent costs there actually fell. That could be "due to large increases in the median household income in those cities," the study says. No matter where you find yourself, living within your means and employing common-sense budgeting tactics can help you save in the long run. Here are a few tips to get started.